I’m not sure how this happened, but the last “treat” I posted was 2 weeks ago. There have been lots of savory things in May but not many sweet. Time to remedy that. What do you do when you need a cake to feed a lot of people? You can make a big fat layer cake which requires filling of some kind and often a buttercream frosting. Or you can go easy on yourself and make a one-layer 12-inch dense chocolate cake with a ganache frosting. You can serve 25 people easily with this baby. Thankfully, I had a cake conversation with my friend and neighbor Julie before I made it. She advised me to cut it like a wedding cake – that is, cut a smaller circle in the middle, cut the outer circle into wedges and the inner circle as you would a regular smaller cake. That would not have occurred to me and my poor friends would have been trying to eat massive wedges of cake – not that there is anything wrong with that. I realize not everyone has a 12-inch cake pan lying around. The only reason I have one is that I made my own 3-tier wedding cake 7½ years ago, but I haven’t used the pan since then. I hung on to it through moves to four different residences and am so happy that I did – this is definitely a cake that I will be repeating. It was easy to make and even easier to eat. It is perfect for those times when all you really want is chocolate with no other competing flavors. Truth be told, I often feel that way and in those moments, what I crave is a brownie. Think of this as a sophisticated brownie with just the perfect amount of over-the-top frosting. The oohs and aahs when you bring out a giant cake are pretty nice too. If you want to buy a large pan, I highly recommend buying what is called a cheesecake pan. When I bought the pans for my wedding cake, I sought the advice of the somewhat cranky but incredibly knowledgeable woman who owns a local cake decorating supply store. If you tried to bake a large cake in a simple cake pan, it would be difficult to get it out without wrecking the cake. The cheesecake pan has a false bottom, much as fluted tart pans do, so you can just push the cake out of the pan without having to turn it upside down. OR, if you don’t want to make a one-use purchase, you can get a little tricky and use alternate pan sizes. It is a testament to how good this cake is that I got involved with a bit of math and figured out things like volume and inches. Using Bing of course – not Google (we are a Microsoft household, wink wink), I found that the volume of a 12-inch round pan is 15 cups. A 13-x-9 inch pan has the same capacity so you could make this same cake in a rectangular pan. If you have two 8-inch square pans lying around or two 9-inch round ones, you could also make it in those. The cakes will be a little flatter because the proportions aren’t exactly right. The chocolate lovers won’t care. Trust me. Preheat oven to 350°F. Spray 12-inch round cake pan with 2-inch high sides with nonstick spray. Line bottom of pan with parchment paper round. Spray parchment paper with nonstick spray. Dust pan with flour, tapping out excess. Sift 2 cups flour, baking soda, baking powder, and salt into medium bowl. Sift cocoa into another medium bowl. Pour 1 cup boiling water over cocoa; whisk to blend. Using electric mixer, beat sugar and eggs in large bowl until light and fluffy, about 2 minutes. Add butter to egg mixture and beat until blended. Beat in cocoa mixture. Add buttermilk and vanilla; beat on low just to blend. Add dry ingredients and beat on low just to blend. Transfer batter to prepared pan; smooth top. Place chopped chocolate, butter, and vanilla in medium bowl. Bring cream and sugar to boil in a medium saucepan, stirring to dissolve sugar. Carefully pour hot cream mixture into bowl with chocolate. Let stand 1 minute. Whisk until melted and smooth. Chill ganache until thickened and spreadable, about 1 hour. That sure is a mighty chocolate cake! 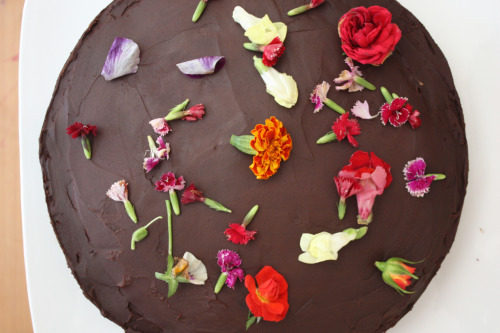 I love the flowers, they really pop on the deep, dark chocolate. Lovely! Not to echo the above to closely but really stunning shot. Also, kudos to you for making your own wedding cake! Gah! That is beautiful. Love the flowers. And the cake looks dark and moist and perfect. Wish I had made that for my birthday. What a great, big, beautiful cake! I finally got caught up on your latest posts, and there was a lot of delicious stuff there. Now, I have a new dip and potato salad I have to try, and the cake pan math here is great info! 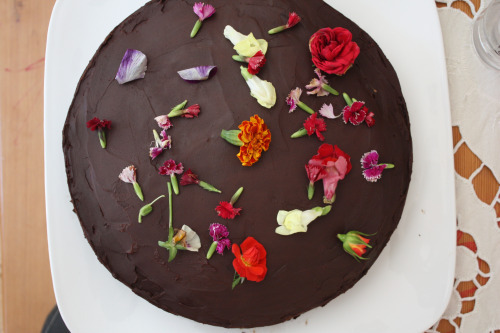 I just baked a chocolate cake and decorated it with pansies! How funny…..your cake is prettier than mine, though. Oh my! That looks over the top awesome! And how pretty it turned out. May seems like a much better month now that I’ve encountered this. Chocolate = heaven. Ganache = even more heaven. A twelve inch cake = the most heaven. Look how perfectly you cut that inner circle! Good job. Love your chocolate cake obsession. I’m so sorry if the cake recipe is unclear. Unfortunately I was away all day yesterday and now our computer has been taken apart because we are getting a new desk today. It’s too hard for me to fix with my iPhone. I know the recipe is up on http://www.epicurious.com if you need it today. I will fix as soon as I am back online. Sorry! You know I’ll be borrowing your 12″ cake pan so I can make this! Aha! I already have the pan, which I use for a Greek nut cake recipe, maybe once a year. Now I have another reason to use it. This looks delightfully sinful! Again, sorry for the omission in the recipe! I just went back in and changed it. Thanks for letting me know! Happy baking. Beautiful! I love the flowers on top. And I’m most intrigued with how you sliced up the cake! I thought the cake in the second picture looked a bit small. And that’s a great tip about buying larger size pans. The biggest I have is 9″ now but maybe I’ll buy bigger ones in the future. 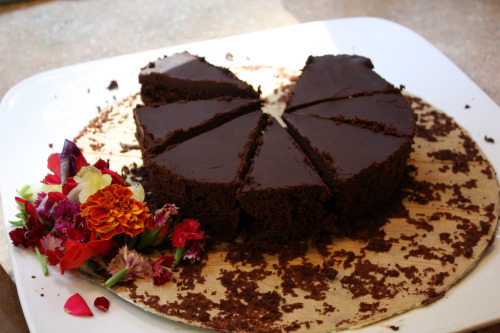 I’m planning to make a chocolate cake this weekend, and this recipe sounds absolutely perfect. My only concern is that it isn’t for any special occasion where I can have any kind of guarantee that it will all be eaten. Do you know how well this cake freezes? This looks delicious! I am baking it for a coworkers birthday and am wondering, if I don’t have a 12-inch pan, and wanted to bake it in two 9 inch pans (a round cake feels more festive than (x13, somehow! ), would you recommend making this as a layer cake stacked upon one another, or is it so rich and dense (the request was “chocolate!”) that one layer is more than enough? I made your cake and it is delicious! I used 2, 9 inch round cake pans and filled the middle with a Chocolate Cream Cheese filling using butter. unsweetened chocolate, cream cheese, powdered sugar, vanilla & sour cream. And then iced it with your ganache, thickened with a little more powdered sugar. Surrounded the cake with sugared berries. It was a hit. I’ll make it again. Very fudgy!